Mifti (Jasna Fritzi Bauer) lives with her brother (Julius Feldmeier) and sister (Laura Tonke), their rich father (Bernhard Schütz) having other ideas of how to spend his time than with his children. Mifti drifts through Berlin, barely going to school. But when she does, she meets Ophelia (Mavie Hörbiger), an actress who has been sentenced to community hours in the school kitchen. The two start drifting through Berlin’s club scene together. It’s around that time that Mifti also meets the intriguing, much older Alice (Arly Jover) in the supermarket who sparks her fantasies. Axolotl Overkill is a fascinating, well-made film that is a little marred by its author/director. But that shouldn’t keep you from seeing it. I haven’t read the book the film is based on, mostly because it turned out that Hegemann actually stole a lot of it from a blogger and other writers. And while I’m all for remix culture, attribution is a big part of how remixes have to work. Plus, I don’t think it’s fair if the remixer makes a lot of money while the remixed are left empty-handed. At least it appears that Hegemann has reached an agreement with the people she stole from by now. The problem is that it still doesn’t make her a likeable person and that she was there and gave an absolutely insufferable Q&A after the film didn’t help my impression with her, either. In fact, after the Q&A I was very much surprised that a person who apparently has so little insight about what she has written (or copied) and then turned into a film managed to make such an engaging film full of complex characters. Because that’s what it is. With excellent performances by the entire cast, especially Jasna Fritzi Bauer and Mavie Hörbiger and a fantastic soundtrack, the film draws you into a world that left me flabbergasted at its privileged nature at times. And even though I’m usually very quick with not being interested in the plight of the upper class, in this case, I remained interested throughout. While I was never bored for a second, I would have sworn that the film is half an hour longer than its actual runtime, it’s that intense and packed. There is just one scene that I wished would have been longer – a dance scene reminiscent of Sia’s videos that was perfectly touching. There were things I struggled with in the film, especially the scene with the taxi driver that should have been structured a lot differently to work as intended. That the timeline remains unclear was less of an issue, but also noted. Altogether, though, Axolotl Overkill develops a force that is as good as inescapable. 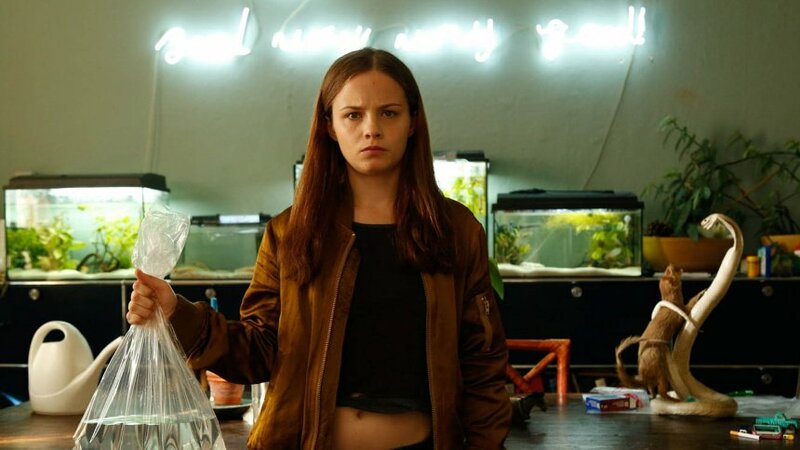 This entry was posted in female director, female writer, movies and tagged 2017, Arly Jover, Axolotl Overkill, Axolotl Roadkill, Bernhard Schütz, Helene Hegemann, Jasna Fritzi Bauer, Julius Feldmeier, Laura Tonke, Mavie Hörbiger, Sabine Vitua by kalafudra. Bookmark the permalink.